Elevated between 4659 ft and 8202 ft, the Ski Resort is among the 5 highest elevated Ski Resorts in Piedmont. The vertical drop from summit to base is 3543 ft. The average difference in altitude between base and summit of Ski Resorts in Italy is 3087 ft. The ski resort is among the 5 ski Resorts with best conditions in Piedmont. 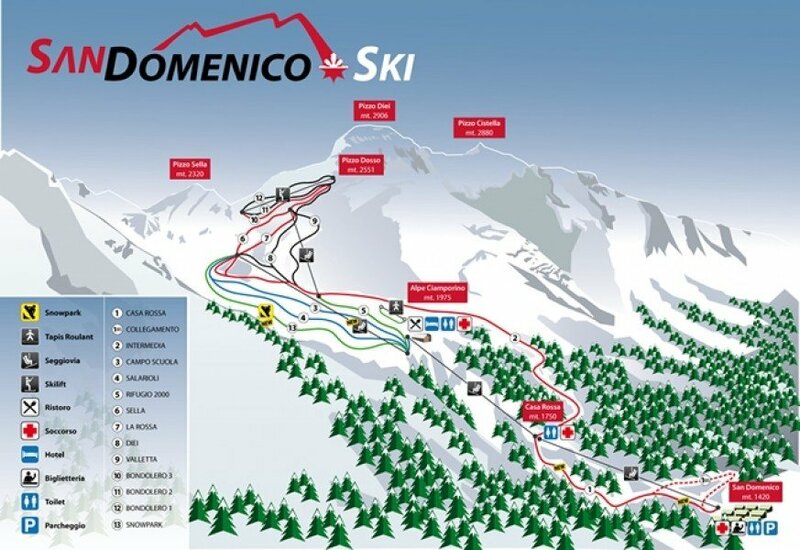 San Domenico is a medium sized ski resort in Ossola Valley, Piedmont region, Italy. The resort is part of the Lepontine Alps and is open in the summer and the winter. A total of 21km of slopes of all ability levels makes this resort very interesting. The slopes are mainly for experts and some of them are fun challenging steeps that take your breath away. San Domenico is surrounded by beautiful Mountains and the setting is just perfect for this resort that has something for everyone. The resort offers everything from on-mountain chalets to some nightlife in the village for those who seek to enjoy après ski.